I didn’t have a clue what he was talking about. Some reporter I was! Robert went on to say that fresh Hatch chiles from New Mexico, grown in the Hatch Valley, were hitting retailers the second week of August. The season is a short one, and he was kind enough to provide us with a box. They come in “mild” and “hot,” and, of course I went for the hot. 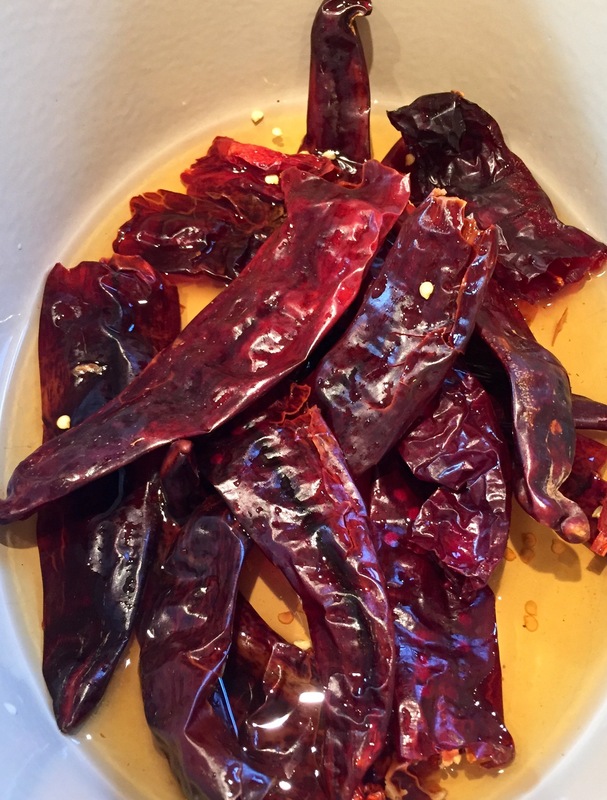 Tracy: I had never cooked with dried chiles before, but I recalled the terrific chicken enchiladas made by our friend and subscriber, Xochitl, that included a fabulous chile sauce made with dried chiles. 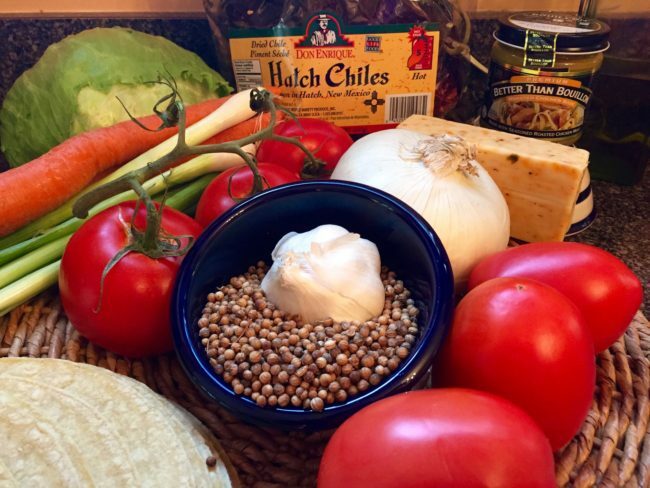 This seemed like the perfect time to try Xochitl’s recipe as not only have I never cooked with dried chiles, I have never made enchilada sauce from scratch either! 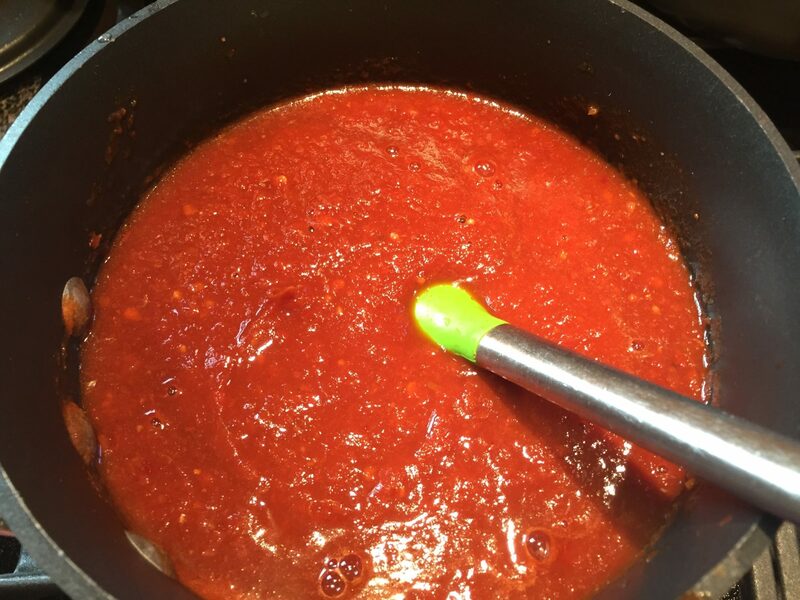 I have to say this recipe turned out great, although if you were going to serve a large group, I would make the sauce the day before to cut down on kitchen time. Just a few comments, one large chicken breast yields about 10 enchiladas. If you need more than that, you will need to cook more chicken. I used Better Than Bouillon, which I had recently been told about, and I will never use boxed broth again. There was plenty of leftover sauce so I would not change that portion at all. 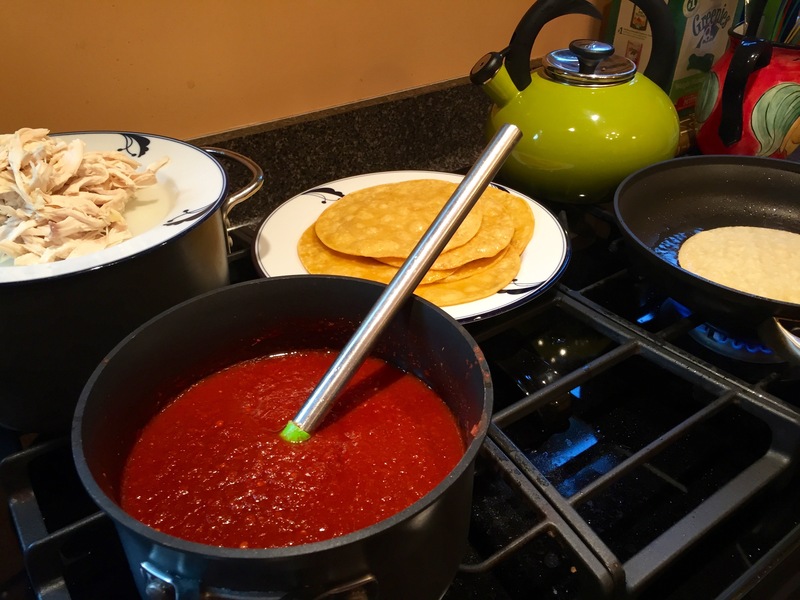 We used the leftover sauce to make Huevos Rancheros Quesadillas, yum! Open the chile pods and remove the stems, veins and seeds. Rinse in water. 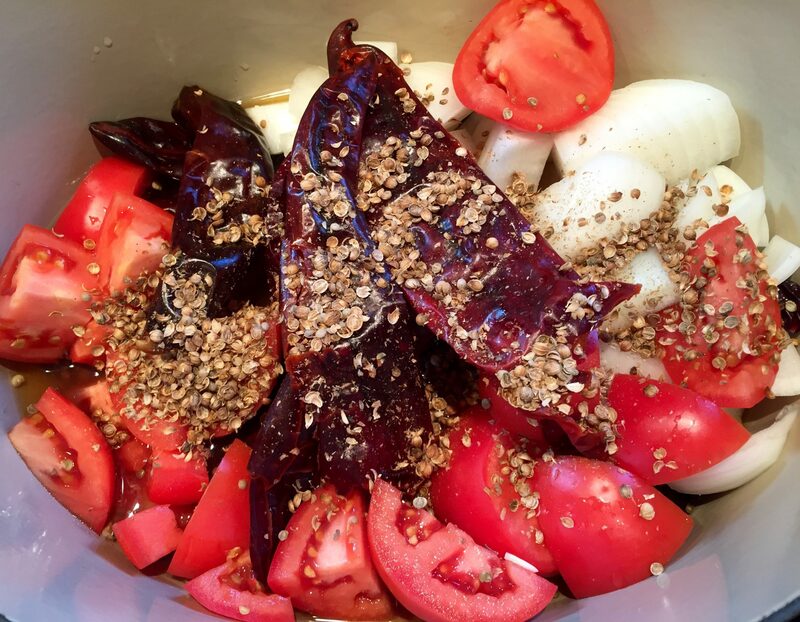 For a spicier sauce, leave in a few of the seeds. Combine all the ingredients in a medium saucepan (I used my Dutch oven) with 3 c. water, and boil until reduced by half. Strain the cooked ingredients (strain to keep cilantro seeds out) into a blender or small saucepan, blend on high for 2 min either in the blender or with an immersion blender, set aside. Discard cilantro seeds. Salt to taste. Combine all the ingredients in medium saucepan, fill with water to cover chicken (about 4 c. water). Bring to a boil, cover with a lid and simmer until cooked, about 30 minutes. Remove the chicken from the pan to a medium plate. Reserve the liquid! Use a fork to pull it apart and let stand for about 10 minutes to cool. Using a fork or your fingers, remove and discard the skin and ribs, and then shred the meat. Return the shredded meat to the reserved broth so it won’t dry out. Remove the chicken from the broth just before assembling. Combine the lettuce, tomatoes, and carrots in a medium bowl and set aside. Add green onions and cheese to separate bowls and set aside. Add oil to a medium skillet, heat until the oil is very hot. Fry the tortillas for about 5 seconds each side. Remove to a small plate. 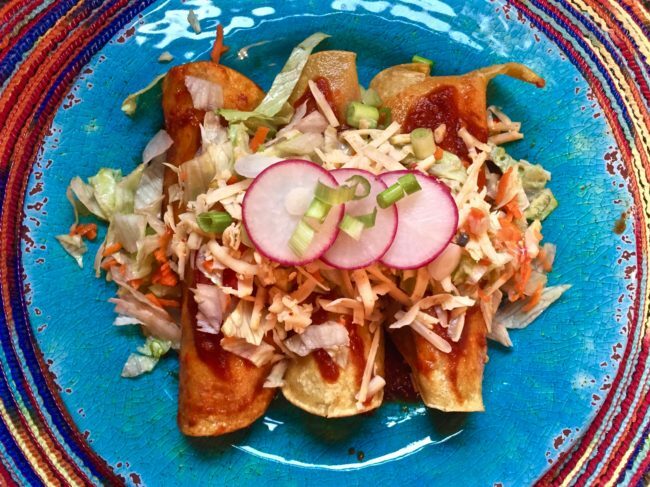 Continue until you have fried all the tortillas. One by one dip the tortillas in the chile sauce just to cover both sides. 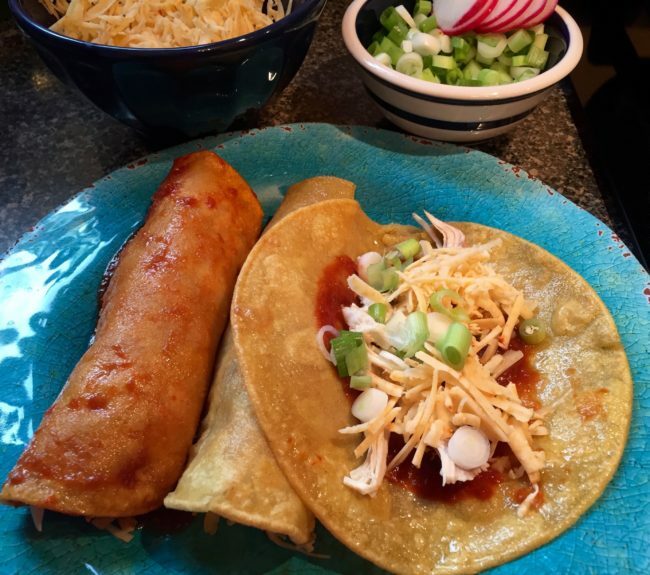 Add chicken to the middle of the tortilla, add a small amount of green onions and cheese, and roll up, placing seam side down on the plate. Top with more chile sauce, grated cheese, and the lettuce mix. Garnish with sliced radishes. Serve right away. Makes 10 enchiladas with plenty of chile sauce left over.